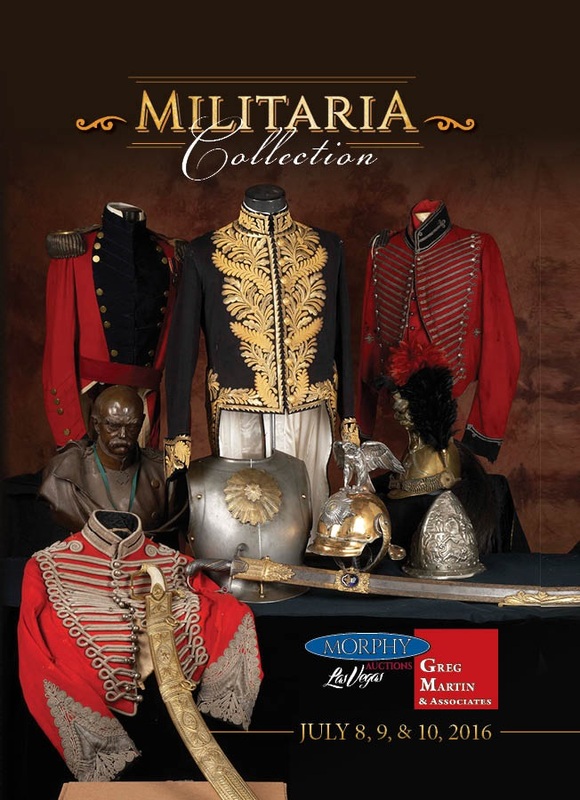 Morphy Auctions’ Spectacular July, 2016 Militaria Sales Event to Feature the Largest Single Owner Collection of Swords, Cannons, Armor, Uniforms, Headgear, Firearms, Accessories, and Artwork Ever to be Sold at Auction. This three-day sale, held in partnership with Greg Martin & Associates, presents 5,000 pieces in over 2,200 exceptional lots across all collecting categories and price points. Morphy Auctions, the finest auction destination for fresh to the market collections, is pleased to announce this once-in-a-lifetime sales event to be held on Friday, July 8th through Sunday, July 10th at the company’s Las Vegas, Nevada auction gallery. This sale features the estate collection of a southern California gentleman who had a lifelong passion for all things militaria. All items in this sale will be available for preview beginning June 8th, 2016. This sale’s selection of over 1,200 weapons from the 16th – 20th centuries is truly cutting edge. Swords, rapiers, sabers, pole arms and variations from England, Europe, the USA, Asia, and the Ottoman Empire are on offer. Highlights include lot #786, an English made, deluxe Indo-Persian officer’s sword estimated at $2,500-3,500; lot #791, a French First Empire Sapeurs infantry sword estimated at $3,500-4,500; and lot #793, a magnificent English Napoleonic era (Prince of Wales) officer’s sword estimated at $3,000-5,000. Collectors will also undoubtedly set their sights on lot #444, an interesting and ornate 16th century German wheel lock long gun fitted with an Indo-Persian barrel. This fine firearm is estimated at $1,200-4,000. This sale’s amazing range of military uniforms, including a full spectrum of coats, vests, pants, shirts, footwear, and other garments, is tailor made for enthusiasts. The 800 lots on offer – representing dozens of countries and periods – all have uniform appeal. Lot #661, a Napoleon I Era officer’s tunic, is a real standout. This red and black wool dress jacket, estimated at $3,000-8,000, is ornately constructed and detailed with bullion wire cording and silver-finished ball buttons. And lot #659, a British Diplomatic or Officer ensemble, is the whole package. This handsome lot, featuring a heavily embroidered black wool tunic, a pair of antique black boots, and red and white plumes, is estimated at $2,000-4,000. With over 200 lots of military headgear on offer, this sale’s breathtaking range of hats and helmets is certain to make headlines. Two original French Cuirassier or Chasseur helmets are among the top picks in this category. Lot #172, a helmet with three fleur-de-lis, and lot #173, a helmet with a horsehair plume, are both estimated at $2,000-4,000. Lot #698, a French 48th of the Line shako cap featuring a white cockade, yellow pom-pom, and star chin scale retainers, will turn heads with its $2,000-4,000 estimate. And battle lines will no doubt be drawn over lot #699, a French Napoleonic 95th of the Line shako cap, also estimated at $2,000-4,000. Fine and decorative artwork also ranks highly in this sales event. Collectors will have the opportunity to decorate their personal barracks with over 100 lots of fine paintings, prints, sculptures, trophies, and other attractive military themed collectibles. Lot #2073, a battle scene bronze by Theodore Gechter (1795-1844, French) features a fallen man-at-arms, a crouching boar attacked by dogs, and a Renaissance-era lord on a horse, blowing his horn and wielding a sword. This masterpiece, set on a rectangular naturalistic base, is estimated at $2,000-4,000. Lot #2076, an unsigned and unnamed larger than life mixed marble bust, comes to life with a white marble head and green marble circlet and robe. This stunning work rocks a $6,000-8,000 estimate. And two bronze Napoleon bust highlights command the auction spotlight. The first is lot #2074, a stunning, large bust of the leader by Renzo Columbo (1856-1885, Italian.) It features Napoleon in a bicorn hat and the Empire Eagle figure at his chest. The piece, inscribed “D Co. 1st Regt. Infty. N.G.P. To The Albany Zouave Cadets, July 21-24 1886,” is estimated at $2,000-4,000. And the second is lot #2075, a shoulderless bust of Napoleon I signed by Jean-Antoine Houdon (French, 1741-1828). Houdon was the preeminent sculptor of the French Enlightenment. This piece depicts Napoleon with tousled hair and a headband and is inscribed, “La Majeste/L’Empereur/et Roy/ Fait l’Apres Nature/St. Cloud/1806/Houdon Fit. Circa 1806.” This lot is estimated at $3,000-5,000. Armor, flags, hand weapons, sashes, badges, epaulettes, medals, and other collectible militaria round out this exceptional auction event.